Intrigued by this unusual new friend, Bo follows the girl with the chili pepper-red boots all over and gets a glimpse of some down-home cowboy living. From bronco riding, to barbecue to hoedown, this adventure has all that Texas living has to offer! 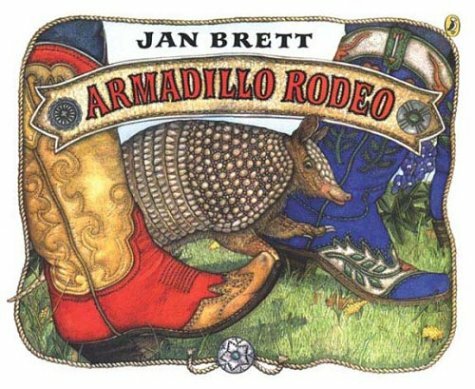 Posted in Bedtime Stories	| Tagged Armadillo Rodeo, bedtime stories, Charles P. Rogers, Children's book reviews, Jan Brett	| Comments Off on Bedtime Stories: Armadillo Rodeo!